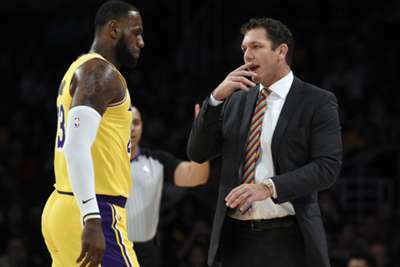 Los Angeles Lakers coach Luke Walton insists he is not worried about his job security, despite the team's 3-5 start in the NBA. ESPN reported on Friday that Lakers president Magic Johnson had reprimanded Walton for the team's poor form, with Los Angeles failing to live up to expectations since LeBron James' offseason arrival. But Walton addressed the issue with reporters later in the day and claimed to have a good relationship with Johnson, keen to reiterate that such meetings are common practice. "I feel like I have a great relationship with management," Walton said. "I feel like I'm coming down here to do my job and coach. I don't feel like I'm going anywhere. "We are in constant communication, so this is not that all of a sudden there's an emergency meeting. This is something we do all the time. What we discuss in our meetings is between us." The Lakers have not made the playoffs since 2012-13 and the team has not had a winning season under Walton since he took over at the helm starting in 2016. Los Angeles went 26-56 and 35-47 over the past two seasons.